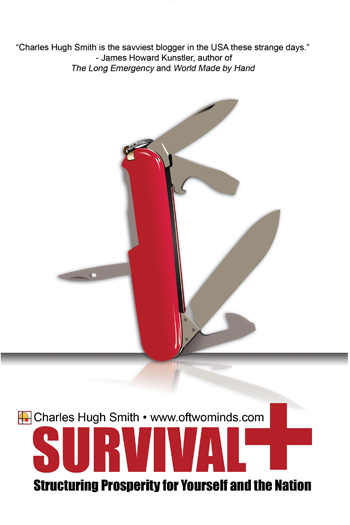 A new improved edition of Survival+ is now available; free ebooks of interest. Following the advice of readers and my knowledgeable friend Richard Metzger, I have revised Survival+ with improved readability and a new cover. The font size has been boosted a point and the text fully justified (in a textual sense, not an intellectual one, heh). For those who tried to order the book this past week and were rebuffed by amazon.com, my apologies; I assumed incorrectly that they would log the order as a backorder and ship when it became available. This second edition will also be limited, as a revised edition will be issued later in 2010. So while I can't promise there will be any demand for each edition, I can promise that each edition will be limited in run and thus potentially "collectable." In the meantime, the book will continue to serve, if nothing else, as an admirable paperweight. As it stands now, the only way to receive a signed copy is to contribute $40 or more to this site (see below). This has been the default setting here for signed books from the start, and while I agree my signature is inherently worthless I myself like books signed by the author. In any event, the option is there. If you were kind enough to contribute money to the site in 2009, I consider that a credit toward the $40 "signed book" offer, meaning that if you donated $25 in 2009 and followed that up with a $15 contribution in January/February 2010, as a token of my appreciation for your financial support I will send you a signed book. It isn't much, but it is a sincere token nonetheless. Without your support, I could not have devoted a year to writing Survival+. The great advantage of controlling the ownership and rights to the book in a POD (print on demand) world is that I can issue new editions at will, with about a 2-week delay while the revision is processed by my publisher CreateSpace. Every book attempting to describe the moving parts of the "long emergency" (James Howard Kunstler's excellent phrase) which will lead to what I term The Great Transformation is necessarily a work in progress, and Survival+ is no different. As new insights and information flow in from you, the readers and contributors, then various weaknesses in the book will slowly be repaired and various redundancies edited out. Given the many other projects weighing my desk, I do not anticipate revisingSurvival+ until the end of 2010. As the status quo inevitably devolves (as per the reasons described in gory detail in the book), then modest revisions will probably be in order. One criticism the book has received is that it doesn't offer up a "survival" action/gear checklist. My blogger colleague M.D. Creekmore at the The Survivalist Blog fills that deficiency with his free 29-page ebook, It's the End of the World As We Know It and I Feel Fine. If you're new to the survivalist literature/blogosphere, you will also benefit from his 2009 post The Ultimate Collection of Survival Resources. My own contribution to the survivalist literature ends and begins with this little essay, The Art of Survival, Taoism and the Warring States. The free abridged version of Survival+ remains available in either HTML or PDFformat. (85,300 words, 141 pages) You are welcome to copy this free (copyrighted) abridged version to your computer or print a copy for your own use. Thank you, Arthur C. ($10), for your very generous contribution to this site. I am greatly honored by your support and readership. Thank you, Dan T. ($25), for your exceedingly generous contribution to this site. I am greatly honored by your support and readership.